Have you ever even heard the terms endemic or non-endemic? If not, then join the club, because these terms are not something you typically hear every day. Secondly, you came to the right place. Understanding the lingo itself is actually NOT that important. I know, I know…after that big lead in and the fancy headline, you are thinking I am crazy. Hear me out though. 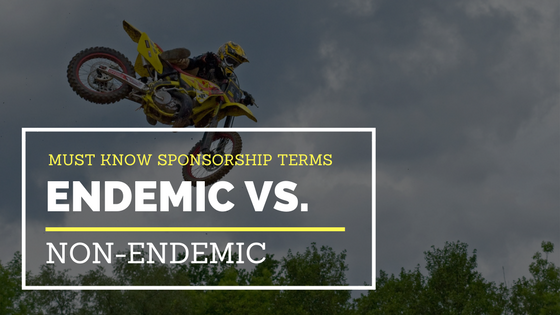 The real reason why this topic is crucial is because endemic and non-endemic sponsors NEED different things from YOU. It is paramount to understand exactly what your sponsor is looking for in return for their investment in you. That understanding begins at the foundational level, like if they are endemic or non-endemic. This categorization can impact everything from your value proposal to the words you choose when writing social media posts that reference your sponsor. Let’s be honest though, correctly mentioning endemic and non-endemic makes you sound like you know what is going on as well. What does endemic and non-endemic mean then? An endemic motorsports sponsor creates products and/or services directly for the motorsports industry. For example, a company that produces offroad racing UTV tires and sponsors an offroad UTV racing team is an endemic sponsor. It is relatively easy to see why this company is sponsoring this race program. Often the performance of the product directly impacts the performance of the rider or racer. A non-endemic motorsports sponsor, however, is not as easily connected to the riding or racing program. Non-endemic sponsors are businesses whose products and/or services are not directly linked to the market, but still benefit from the marketing strategy. For example, if an energy drink company sponsors a UTV racing team (which they often do) their product is not directly linked to the performance of the UTV racing team and is not a critical product or service required for the team to compete. Instead, the energy drink company is attempting to associate their brand with the race team, thus influencing the race team’s fans to want to create a closer connection with the team by drinking the energy drink. Another example of an endemic sponsor would be a company that produces racing neck braces. Racing neck braces are not used outside of the racing world. This company may be attempting to associate themselves as the go-to brand for neck braces among the racing community. This type of product will not appeal to the average consumer because they likely do not need that level of protection. However, the other racers at the track may be the target of that sponsorship, and the time spent marketing to the consumer should be limited.